On Wednesday the 10th of February the association AlbumArte will inaugurate a series of screenings of films and videos by artists entitled AlbumArte | VideoArtForum, all of which will be held at the exhibition space on Via Flaminia in Rome, lasting until April 16th 2016. There will be 5 separate events, held at two-week intervals, each one lasting 4 days and featuring a specific artist, amounting to 5 different artists. Over the four days of each event there will be multiple screenings of each artist’s work, starting on the first evening at 7.30pm with a screening of one or more films in the presence of the filmmaker. They will be introduced by the curator of the artist’s works and will then be freely discussed by the audience, as was the custom for Italian film clubs during the seventies. Screenings will continue over the next three days – Thursday, Friday and Saturday – from 4pm to 9pm, with the most significant creations of each artist who is the protagonist of the four day event being shown in various separate areas of the exhibition space of AlbumArte. This project confirms the ongoing interest of AlbumArte in the field of video art, an expressive medium with which the association has been involved ever since it was founded, thanks to a series of initiatives of this kind in Istanbul from 2011 to 2013, which were followed by two further events held in Rome in 2015, at the Galleria Nazionale d’Arte Moderna (GNAM) and the exhibition area of Via Flaminia. AlbumArte is thus consistently continuing its investigation of this particular area of artistic creation. This initiative will constitute a further opportunity for analysis and study on the subject of videos and films made by artists, with the possibility of participation in the debates and discussions with artists, curators and enthusiasts, as well as by means of a more passive approach, simply enjoying the series of screenings and taking the time for personal reflection upon them. 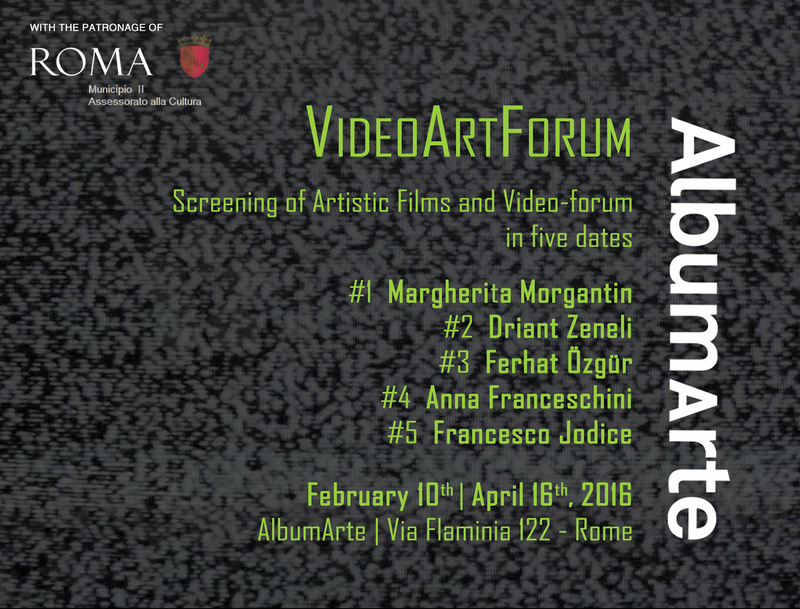 Thanks to the AlbumArte | VideoArtForum Roman audiences will have the opportunity to learn more about the work of five different artists, three of whom will be presented for the first time in Rome: the Turk Ferhat Özgür, the Albanian Driant Zaneli and the Italian Margherita Morgantin. Making up the numbers there will be two more Italians: Anna Franceschini – who was artist in residence at the MACRO Museum of Rome in 2014 – and Francesco Jodice, who after VideoArtForum will inaugurate solo shows in important Italian public spaces. The project was developed with the patronage of Assessorato alla Cultura, Grandi Eventi, Turismo, Relazioni Internazionali del Municipio II of Roma Capitale. Initial screening and debate on Wednesday introduced by Paola Ugolini at 7.30pm. Screenings from Thursday to Saturday from 4pm to 9pm . Initial screening and debate on Wednesday introduced by Cristiana Perrella at 7:30pm. Initial screening and debate on Wednesday introduced by Vittorio Urbani at 7:30pm. Initial screening and debate on Wednesday introduced by Ilaria Gianni at 7:30pm. Initial screening and debate on Tuesday, April 12 at 7:30pm. Introduced by Adriana Polveroni. Screenings from Wednesday to Saturday from 4pm to 9pm . Each debate on Wednesday will be followed by a light buffet meal. On the days of the event the opening hours of AlbumArte will correspond to the times of the screenings. The secretariat will however be available to provide information from Monday to Friday from 3pm to 7pm.